You are currently browsing the archives for the Debates category. Last Tuesday night, Keith Ellison was elected to replace Lori Swanson as Minnesota’s Attorney General. In this post, I wrote about Skip Humphrey and Walter Mondale’s op-ed endorsing Ellison for the AG position. Prior to that op-ed, I’d thought of them as terrible on policy but somewhat of a family legacy. After that op-ed, I’m forced to admit that they’re just like most DFL politicians. They’re a pair of political hacks who put the DFL ahead of what’s best for Minnesotans. They’re a pair of losers, too. Jesse ‘The Body’ Ventura defeated Norm Coleman but he thrashed Skip Humphrey. After that thrashing, Skip had gone into hiding. He would’ve been better off if he’d stayed out of the limelight. Those moment have been eclipsed by Skip Humphrey’s and Walter Mondale’s endorsement of a man who has frequently supported cop-killers. Keith Ellison is a low-life who isn’t qualified to be Minnesota’s AG. It’s quite telling that the DFL hasn’t shown any remorse for endorsing a man credibly accused of beating his ex-girlfriend and who has begged the Castro government not to release Assata Shakur back into US custody. Tina Smith’s idea of listening? Stephanie Dickrell’s article on Tina Smith’s St. Cloud visit should be laughed at. It isn’t because the article was poorly written. It’s that Tina Smith said some ridiculous-sounding things. It isn’t that we shouldn’t respect each other. It’s that Tina Smith hasn’t practiced what she’s preached since she got to the Senate. When Anthony Kennedy announced his retirement from the Supreme Court, President Trump nominated then-Judge Brett Kavanaugh. Within minutes, Tina Smith announced that she wouldn’t vote for Kavanaugh. When Dr. Christine Blasey-Ford was outed by Sen. Feinstein as having been attacked by Kavanaugh, Smith again said that she wouldn’t vote for Kavanaugh, saying that the charges were too serious. The charges were serious. The evidence wasn’t. The 4 people who were supposed to verify Dr. Ford’s story sided with then-Judge Kavanaugh. Dr. Ford’s best friend said that she didn’t even know Kavanaugh. Tina Smith’s words are nice. Unfortunately, her actions speak louder than words. That’s why I’m voting for Karin Housley. She’s a woman who gets things done. When she heard about seniors in nursing homes getting abused. Karin dug in to fix the problem. Unfortunately, she ran into a roadblock named Mark Dayton, who vetoed the bipartisan bill that would’ve fixed the problem. Compare that with Tina Smith’s inaction. The problem happened while she was Lt. Gov. She did nothing. No investigations. No disciplinary actions, either. Many of the complaints weren’t in the Twin Cities so, to Tina, they didn’t exist. To Tina, land outside the Twin Cities exists only for photo ops. When thinking about Kyrsten Sinema’s sudden slide, I’m reminded of the ancient Hee Haw song line “If it weren’t for bad luck, I’d have no luck at all.” This week, Sinema suffered the embarrassment of having an endorsement rescinded. The race has gotten ugly in recent weeks, with McSally asking Sinema to apologize for comments she made during a 2003 radio interview about American intervention in Iraq and Afghanistan at the end of a contentious Oct. 15 debate. The radio host made a comment about joining the Taliban, to which Sinema responded, “I don’t care if you want to do that, go ahead.” McSally, a former fighter pilot, accused Sinema of supporting treason and asked her to apologize. Since then, Sinema’s slide started and has continued. On another note, NBC reports that early voting in Arizona favors Republicans this time. Howard Root’s counterpoint op-ed highlights the one big mistake that might sink Tina Smith. What campaign manager thinks that having an empty podium sends the right message? 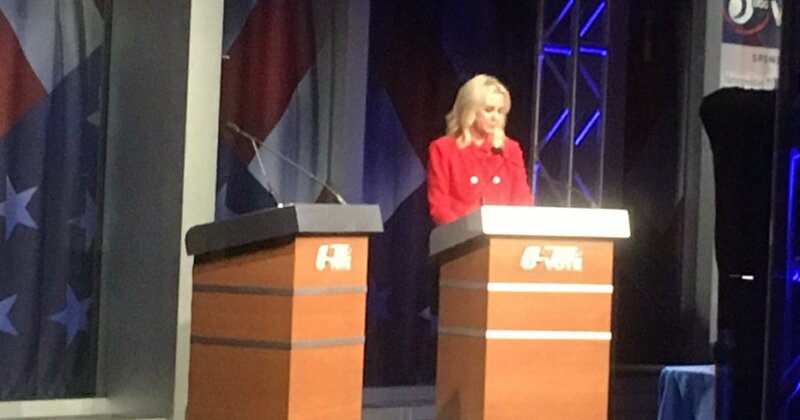 Why was Smith a no-show for the Oct. 21 debate that was broadcast live statewide on KSTP and its four affiliates? Five days before the long-planned debate, her campaign cited “a complicated schedule” that precluded Smith from participating and cameras were left showing Karin Housley on stage answering questions next to an empty podium. This was the only televised debate in which voters could see and hear the candidates provide impromptu answers to questions asked by an impartial moderator — yet the unelected senator refused to show up. Let’s state something fairly obvious. Tina Smith is pretending to know and/or care about parts of the state she knows nothing or little about. She doesn’t know anything about pipelines. She knows even less about agriculture. It isn’t like Tina Smith is winning over Trump voters in rural Minnesota. If Tina Smith keeps running a terrible campaign and Karin Housley keeps running a positive, upbeat campaign, it’s likely that Mrs. Smith won’t go back to Washington. That’s code for Tina not wanting to debate. If Tina had scheduling conflicts, she should’ve eliminated them to participate in the debate. By dodging the debate, Tina Smith sent the message that her other event, if it actually exists, is more important to her than informing Minnesota voters. In one sense, it’s perfectly understandable. Tina Smith has been a do-nothing senator. She’s done what Senate Democratic Leader Chuck Schumer and the Democrats’ special interests have told her to do. Why would Tina Smith want to defend that indefensible record? This article highlights a couple of important things. First, it’s indisputable that getting President Trump’s is a huge advantage. Next, though it doesn’t talk much about it, DeSantis’ trouncing of Putnam at the Fox News debate has given DeSantis’ campaign much-welcomed momentum going into the final month of the primary campaign. It’s important to differentiate between GOP candidates this year and losing candidates in past wave elections. In 1994, 2006 and 2010, losing incumbents and candidates distanced themselves from presidents Clinton, Bush and Obama like they were toxic waste. This year, Republicans can’t wait to get President Trump’s full-throated, enthusiastic endorsement. It’s worth noting, too, that this year, unlike past wave elections, the majority party isn’t defending something terribly unpopular. In 1994, Democrats were caught defending the House banking scandal and the House post office scandal. In 2006, Republicans got stuck in the impossible position of defending the Bob Ney scandal, the Mark Foley scandal and the terribly unpopular Iraq War. In 2010, Democrats didn’t have a chance after ramming the ACA down our throats against our will. This election, Republicans ‘have to’ defend the extremely popular Trump/GOP tax cuts. Democrats will lose seats in the U.S. Senate, too. Wave elections happen when Americans develop a throw the bums out mentality about the Republicans or Democrats. That’s definitely missing this year. Game. Set. Match. It isn’t championship yet but it was definitely a momentum-changer.